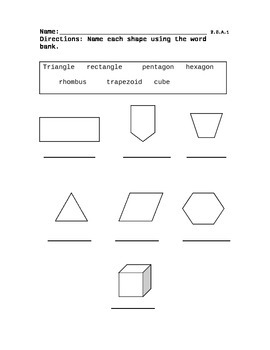 This is a basic quiz to assess students' knowledge of triangles, quadrilaterals, pentagons, hexagons, and cubes, as is required by Common Core math standard 2.G.A.1. This quick quiz has a word box with the above words listed, and below that, the shapes in random order with lines beneath them. The students write the name of the shape, using the word box, under the shape. This is meant to be a quick evaluation of students' progress on this math standard. Erin Linde by shape quiz is licensed under a Creative Commons Attribution-ShareAlike 3.0 Unported License.